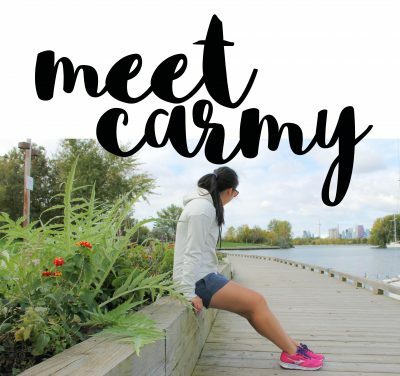 Carmy is a healthy living blogger based in Toronto. On her blog, she features simple, healthy recipes and meal preps alongside stories from her travels and healthy living journey. She is not a physician, registered dietitian, or nutritionist of any sort. Everything that shared here on carmyy.com is based on her own opinions, research, and personal experiences. What works for her may not work for you. Everything unless stated otherwise is paid for by herself. There are sponsored blog post but all opinions are her own. Thank you for supporting the brands who support Carmy as it helps to make this website possible and free for you to access. Here at Carmyy.com, we never sell, give away, rent, or lease your personal information to third parties. The only personal information we collect is what you give us. When you leave a comment, or communicate with us by email, you may choose to give us personally-identifiable information such as your name, email address, geographic location, or other information which could be used to locate or contact you. Carmy owns the rights to the recipe photo content and recipes on this blog. All recipe photography on this site is her own unless otherwise indicated with a source link such as in round up posts where other blogger recipes are linked to and shared. Please do not republish any recipe or post without permission. However, if you want to use one of our photos with a link back for a round up style post (ie: 10 Chicken Recipes to Try! ), that’s fine. If you are unsure, you are welcomed to contact us for clarification. Reposting without credit is not allowed. Posts may contain affiliate or referral links. Your support is appreciated. Affiliate links means Carmyy.com will earn a small commission on the product recommend but it is of no extra cost to you. We use Google Analytics to understand how the website is being used in order to improve the user experience. User data is anonymous. Google Analytics is a web analysis service provided by Google. Google utilizes the data collected to track and examine the use of this blog, to prepare reports on its activities and share them with other Google services. I am not a professional chef, dietitian, medical professional, or nutritionist. Calorie information is provided on some of my recipes using my recipe plugin. Calories may differ from the ingredient/brand you are using. We do work with brands on paid partnerships as a way to ensure that the recipes created here are free to access. However, all reviews and collaborations are our own opinion. Thank you for supporting the brands who support this blog.